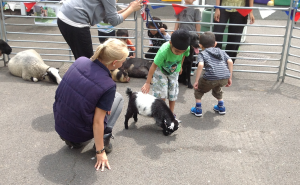 "My apprenticeship at Ark Farm has built my confidence and knowledge with different species of farm animals, handling the animals and interacting with people by telling them about each individual animal. Working for Ark Farm offers great opportunities for me by helping me with my assignments for college studying animal management and now my Level 3 Agriculture. I am now able to carry out tasks that I have learnt on the job Ark Farm. I'd definitely recommend an apprenticeship at Ark Farm as you can learn a lot from your time here with the wide range of very diverse livestock".